Flowchart outlining the methodology used to apply word stress placement. You now know about stress and about the structure of words in English, but we still haven’t looked at the rules that can help you predict the placement of stress in English words. Here is an overview of the approach we will adopt to place the stress correctly. The first question to ask is: is the structure of the word simple (i.e. it doesn’t include any affixes)? If it doesn’t have any affixes, it follows the Normal Stress Rules (NSR). If the word has prefixes and/or suffixes, then we need to look at the nature of the prefixes and suffixes. As we discussed in the previous section, there are historical and contemporary prefixes, which will influence the stress patterns of the words. Neutral suffixes, which do not influence the placement of the stress. Non-neutral suffixes, which cause a shift in the placement of the stress to a different syllable in the word. Stressed suffixes, which cause a shift of the stress to themselves. Here is a print-out that lists how suffixes affect word stress placement. 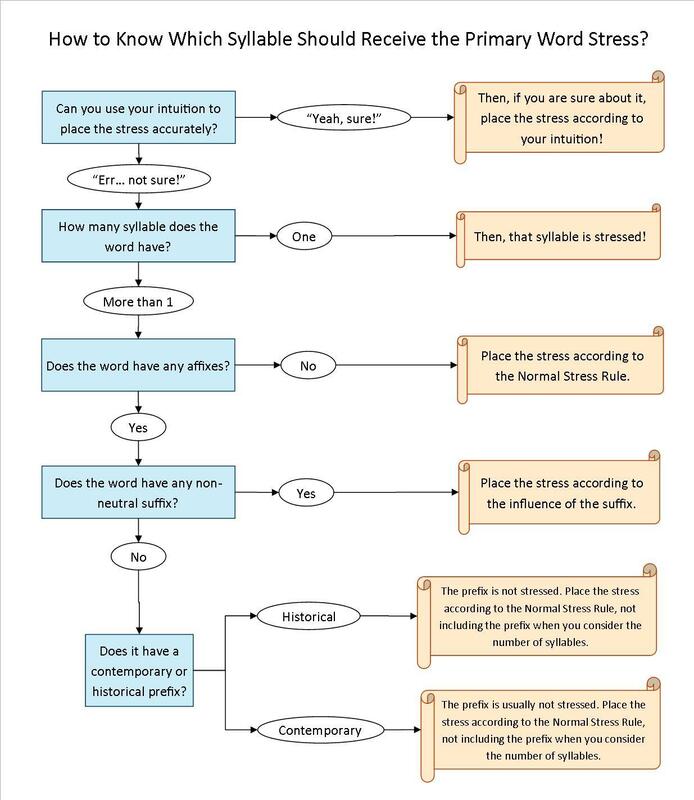 This flowchart gives you an overall view of the process, but you can see that at several stages, we still do not know exactly what to do in response to the answers to these questions to place the stress in the word. Keep exploring this “Word Stress Rules” section to find out!